The legacy we’re made for. On campus, our community spaces serve as transformation zones: places where our students engage their mind, body, and spirit, whether it be eating with friends, working out, or gathering as teams to learn and grow. With unprecedented growth over the last 15 years, we’re investing in a new dining hall that will be enjoyed daily by nearly every student on campus, fitness facilities for all students, and a new convocation center and arena that will allow us to gather on campus for a variety of activities, while giving our athletes a competitive edge on the court and our coaches the competitive edge in recruiting. Athletics, and being a member of a team, teaches our students how to become leaders. The skills acquired in time management, communication, and teamwork cannot be matched. Together, we are creating a championship tradition. Through the Educators College, we have created a model that is a national exemplar for educating teachers, principals, and administrators. We're developing and empowering innovators and transformational leaders to create dynamic learning environments that enable all children in all schools to achieve their highest potential. We’re partnering with Indianapolis Public Schools, Catholic schools, and many other school systems throughout the state of Indiana to train new leaders for K-12 schools. We’ve made a bold commitment to recruiting top talent into K-12 education, and it’s receiving national attention. That’s why we’re committed to offering freshmen students full-tuition scholarships in partnership with the state of Indiana and the philanthropic community. The biggest impact that teachers can have in the world is to shape and mold students, not just academically, but socially and emotionally, too. In the classroom, I demand respect, but also show that I care. My students know that I love them, and that I'd do anything for them. That makes all the difference. At the Byrum School of Business, every student is engaged in real business from day one. We structure our courses as team-taught experiences, hands-on business sessions where students work on solving relevant problems and focus on improving individual skills within the context of team performance. Support for the Byrum School of Business will help build a more collaborative learning environment and allow more endowed scholarships for talented business students. The Paul J. Norman Center, home to the Byrum School of Business, is designed to represent the changing work styles and mobile technology of businesses today with trendy breakout areas, expansive glass walls, and open perimeter spaces. The dramatic two-story atrium provides flexible work zones with tiered collaboration space configurable for presentations, creative brainstorming, or casual student gatherings. Marian University helped shape me into the leader I am today through countless opportunities provided to lead and serve others. Not only were those experiences beneficial, but the foundation of Marian's fine education equipped me with the skills I needed to be successful. Throughout the coming decade, our nation will experience unprecedented challenges in healthcare. The current shortage in doctors, nurses, administrators, and care givers will continue to grow, creating a need for institutions of higher education to fill the void through new and expanded academic programs. Marian University has responded by opening the state's second medical school, and is the among the first in the state to offer Certified Nurse Anesthetist/Nurse Practitioners doctoral programs. To accommodate the growth and allow for expansion of our health sciences programs, we need to build and update laboratories and research facilities, expand endowed scholarship programs for nursing and medical students, and support faculty and student research. I think service can take many forms in healthcare--by working to provide the best care to a patient, taking time to help understand a diagnosis, or even being a shoulder to cry on or offering a word of kindness. As a resident-physician, I have the opportunity to incorporate the practice of servant leadership into my work. Our mission calls us to provide educational opportunities to a diverse and academically talented student body. Without substantial financial aid, a college education would be unavailable to these very students who enrich our campus community. Beyond the more than $20 million in scholarships awarded each year, Marian has developed and funded programs and initiatives like the 21st Century Scholars Program, the Helping Hand Fund, and Latino outreach aimed at increasing access to ensure all students realize their dreams. The liberal arts and natural sciences are at the heart of educating transformational leaders. Through our College of Arts and Sciences, students become lifelong learners and leaders who are intellectually curious, creative, and not afraid to dream. Experiential learning opportunities like internships, service projects, and study abroad, allow our students to broaden their horizons and graduate with a diversity of experiences. We need your help to ensure students from all backgrounds have the opportunity to become future leaders. Receiving a scholarship tells me my success is possible and my dream will be achieved. Without that help, my dream of becoming a doctor would not be possible. As a Catholic university in the Franciscan tradition, we have been called to prepare students who will lead the Church through ordained ministry, religious life, lay ministry, and careers pursued in response to God's call to serve. We’ve created the nationally-renowned San Damiano Scholars Program for Church Leadership, and partner with the Church—especially the Archdiocese of Indianapolis—to educate seminarians. Furthermore, all members of our community, seeking a holy and contemplative setting in which to reflect and grow closer to God, need sacred places and visible symbols of our faith and heritage. Priority projects include the restoration of the St. Francis Colonnade and Gardens and renovations to the chapels where our community gathers to worship together. Everything in my life is based on my faith. to be able to go to college with my faith alongside, and parallel to, my studies is such a blessing. The legacy of Marian expands. When you give one student an opportunity, your gift multiplies in the lives impacted by that one person. A Legacy We’re Made For is our response to society’s critical need for transformational leaders. Your donation makes all of this possible. Scholarships allowed Scott Bruns '96 to choose Marian University for college, a decision he credits with changing his life trajectory. "I received a wonderful scholarship that allowed me to come to Marian and really expand my horizons, both personally and professionally," Bruns said. 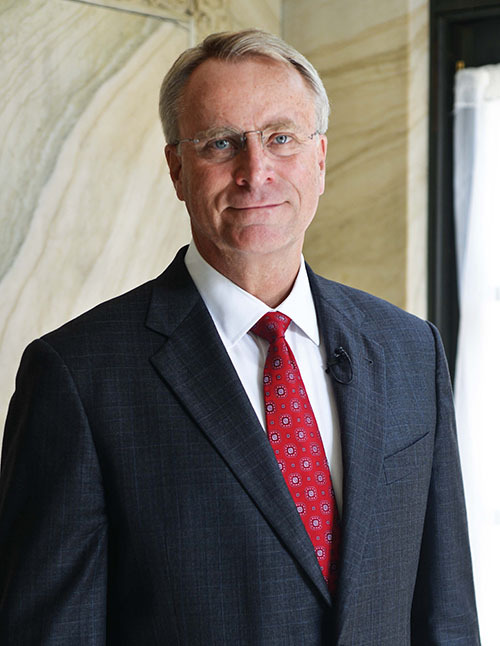 Bruns began his career with EY—the largest public accounting firm in the state and one of the big four in the world—as an audit professional in 1996. Throughout the last 20 years, he has had many opportunities with the firm, working his way around the world and to the top of the Indianapolis office. 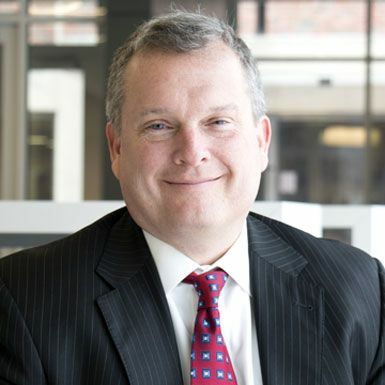 Now, he's the managing partner of the firm's Indianapolis office and leads more than 400 people. As chair of the Support Leadership Scholarships and Experiential Learning Excellence, Bruns believes in creating the same opportunities for the next generation. "Being the chair and being able to help guide the initiative for scholarships really means a lot to me and my family," Bruns said. "It's a great investment and a great opportunity to help students be successful in their careers." If you are interested in being a part of the Support Leadership Scholarships and Experiential Learning Excellence initiative, please contact Wendy Faust at wfaust@marian.edu or at (317) 955-6210.